Can other colours used in the painting make a yellow area appear more vivid? In my last post, I discussed the choice of yellow paint and ways to apply it. For a look back at that, click here. Interestingly, a yellow section of a painting can also be made to appear more prominent by the use of other colours and tones in the picture. That is what I shall look at today. If you use low chroma, dull colours close to your patch of high chroma (i.e. vivid) yellow, this can help the yellow to “sing out” and glow in comparison. For example, in the landscape below by Becky Joy, the predominant colours in the clouds are muted mauves, and the land is painted using muted, earthy colours. There is a rather high chroma area of blue in the top right corner, but this is kept separate from the bright yellow sun and serves to counterbalance it rather than competing for attention. 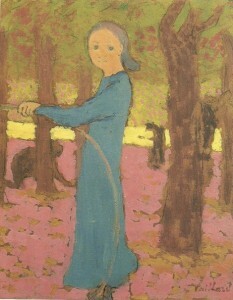 At first glance, “Girl with a Hoop” appears full of bright colour, but the pink and blue turn out to be quite muted, dusky colours when we look more closely. “Warm” colours = oranges, reds, etc. If we bring blues or mauves into the area around the yellow, the glowing effect of the yellow can be enhanced. The complementary effect comes into play, as blue and purple are far distant on the colour wheel to yellow. In this instance, the cool colours are often muted by being mixed with white and/or other colours. 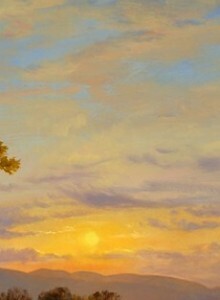 To take an example seen in real life, the glowing effect of the setting sun is enhanced by the cool mauve of distant mountains and clouds, as in the detail, below, of a painting by James Gurney. The full painting is shown at the top of this post. By the way, I highly recommend his blog and website (links listed below) for many more ideas about the use of colour and light in realistic painting. The tactic of placing small patches of mauves and yellows close together was also used at times by the Impressionists. The painting by Claude Monet, above, can be seen at the Barber Institute in Birmingham, one of my favourite galleries. This sunset image glows fantastically. When seen for real, the yellow glow of the painting is quite startling. 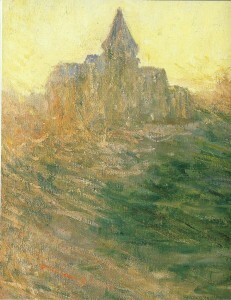 The effect is partly produced by the colours used in the church and landscape. Though the warm sunset is spilling warm orangey tones over the church and ground, there are definite cool mauve-grey brushstrokes used in the roof of the church. These cool colours seem to enhance the zingy effect of the adjacent yellow sky. 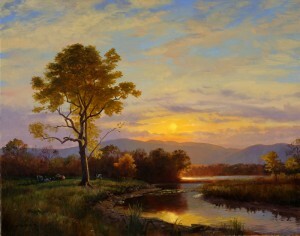 Take another look at the landscape pictures by James Gurney and Becky Joy higher up this page. 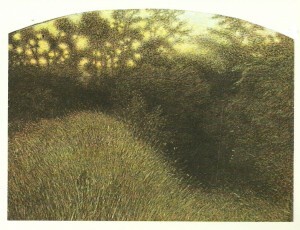 Both use a patch of fairly high chroma blue at a distance to the glowing yellow sunset. Blue and yellow are almost opposite one another on the colour wheel, and each can be considered to enhance the impact of the other when used in this way. In particular, dark objects in front of the yellow “read” as silhouettes, and suggest that the yellow patch is a glowing light source. 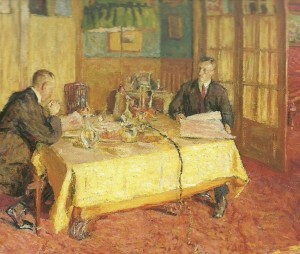 Below, for example, is an interior by Eduoard Vuillard in which the light would be expected to emanate from the visible lamp in the centre. However, the dark figures and objects in front of the yellow walls give me the sense that the wallpaper itself is glowing. This glowing yellow wallpaper gives the image an oppressive atmosphere. Look again at the tense postures of the two figures and the way in which the figure on the left is clawing her hand. I wonder what they are thinking. Technically, the warm “spillage” of colour over other objects in the picture can be created by glazing over with a warm (orangey) wash of colour or, with opaque paint, by aiming at a diffuse warmer colour when mixing. 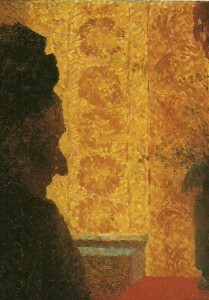 Here is Vuillard’s grandmother again, this time shown in close-up so that you can see the specks of warm light over her silhouette. When we look at the setting sun, a candle flame, or any other bright light source in real life, we see a bright halo of coloured light around it. Replicating this in a picture helps to create the illusion of a dazzling light source. I believe that adding warm colours of increasing redness and darkening tone around your yellow patch can make it appear more luminous, even if you are not trying to replicate the effect of a true light source. 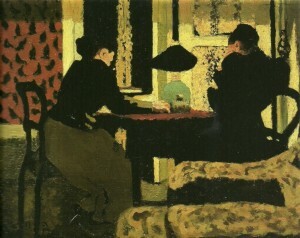 Take a look at Vuillard’s picture, below. The near surface of the yellow tablecloth seems wonderfully bright and warm in colour. To suggest that your patch of yellow is glowing like a candle or like the setting sun, bring a darker-toned warm (orange-red) colour into your picture at a little distance from it. 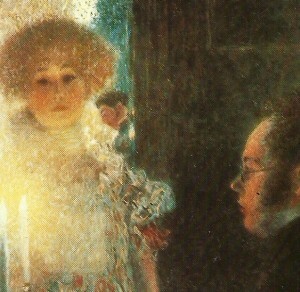 This is a “trick” for painting candlelight, but consider using the same technique to make any patch of yellow appear to glow warmly, even in more abstract pictures. The glowing effect is produced by the very bright tone of the sunlight as seen between the bramble stems, but also by the way in which this tone gradually darkens as it spreads out. Stems of the shrub that are in front of the sunlight are lightened in tone instead of being silhouetted. This gives the effect of a very bright light source coming from behind them. Place duller, low chroma colours next to your yellow patch. Use cool colours close to your yellow patch. Use a bright blue elsewhere in the picture (not touching the yellow). Put dark-toned shapes in front of the yellow, to mimic a silhouette effect. “Spill” warm yellow-orange colour into adjacent areas of the picture. Mimic a corona effect by surrounding the yellow with a halo of bright orange like a setting sun. Bring a mid to dark-toned warm (reddish) colour into the picture at a distance from the yellow. Lighten the tonal value of dark objects that are adjacent to the yellow patch. The above tricks and ideas are not rules set in stone, but are helpful to play around with in various combinations when creating either realist or abstract pictures. James Gurney website and blog (a wealth of information about realistic drawing and painting). The book, James Gurney’s “Color and Light”, is also fascinating and relevant. Becky Joy is also interested in colour and light. 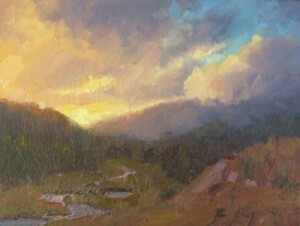 Her website includes tips for artists and information about her plein air workshops. Thank you for this – I sit and stare at Vuillard images in amazement – he is one of my favourite artists- I love that you are able to talk meaningfully about attributes of his work – I’m currently investigating how to make things glow ( at an amateur level) and have found your discussion so helpful.